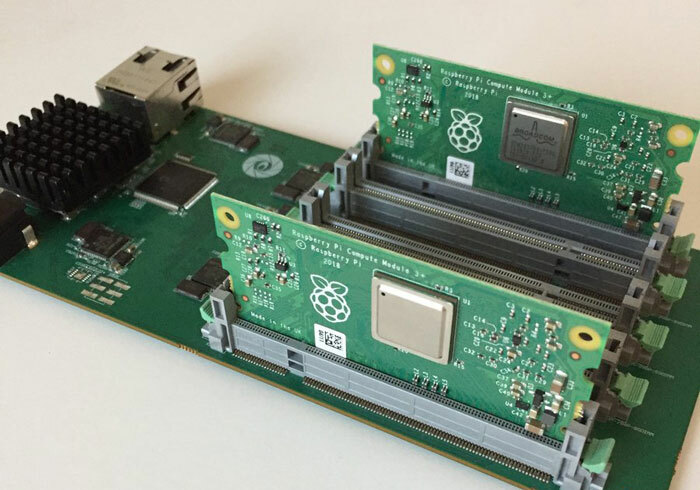 The Raspberry Pi Org has just announced that it has released a new Compute Module, and it is available immediately. 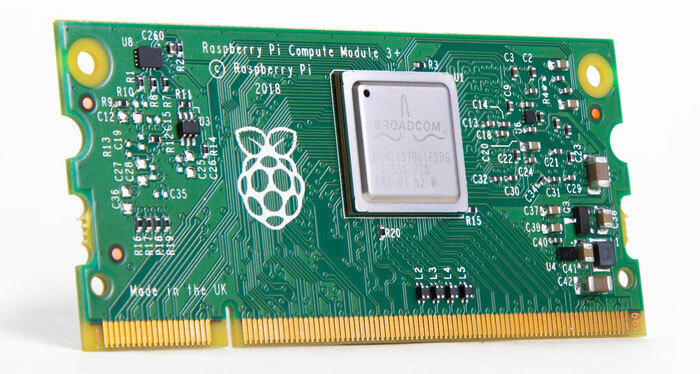 The highlights of the CM3+ in comparison to the CM1 are that it delivers "over ten times the ARM performance, twice the RAM capacity, and up to eight times the Flash capacity," notes the RasPi blog. Compared to last year's CM3, the biggest change is the choice of soldered-on eMMC flash memory, from none, through 8 and 16GB to 32GB. Base pricing remains $25 – but rises to $40 depending upon eMMC capacity. Processor: Broadcom BCM2837B0 SoC, with quad-core Cortex-A53 64-bit @ 1.2GHz. Multimedia: H.264 and MPEG-4 decode (1080p30); H.264 encode (1080p30); OpenGL ES 2.0 graphics. SD card support: CM3+/Lite brings the SD card interface to the module pins allowing the user to connect either an external eMMC device or SD card. Environment: Ambient temperature of -20 to +70 degrees C.
You will see above that the CM3+ is based upon the same processor as the Raspberry Pi 3 Model B+. However, due to the compact dimensions and power constraints in this form factor, the Compute Module 3+ BCM2837B0 SoC runs at a lower frequency (1.2GHz instead of 1.4GHz). Interestingly the CM3+ can support up to two cameras, two displays, and extra GPIO – it can actually support more interfaces than its 'full-sized' relative. To manage this feat, it needs to be installed into some kind of motherboard such as the CMIO board, pictured above. Third party solutions such as the Revolution Pi from Kunbus, and various NEC digital-signage displays incorporate a socket for CM3(+). At this point it is worth noting that the CM3+ is "a drop-in replacement for CM3 from an electrical and form-factor perspective". Below you will find the CM3+ product matrix. 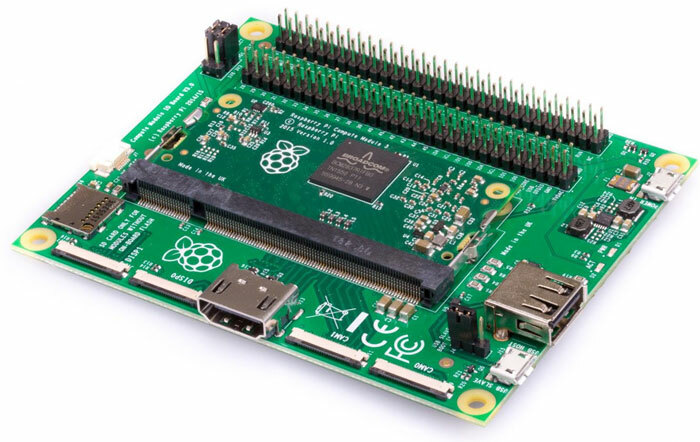 The Raspberry Pi Org pledges that the CM3+ will be available until at least January 2026. You can buy the Raspberry Pi Compute Module 3+ at the usual distributors such as Farnell element14 in Europe, element14 in APAC and Newark element14 in North America. It would be great if they shrink it to 22nm or smaller. They could easily do 1.8GHz multi-core but aim for doubling multi-core performance of the A53@1.4GHz. Choice of ARM core, on chip cache and RAM bandwidth can make a big difference. That's really cool. Big up!